For Park benches and other out door uses. For picture frames, memory boxes and other indoor uses to remember your pet. To be put in a garden, flower bed, or along a walkway. Just wanted you to know we received the plate for our beloved Jack Russell today. I wanted to thank you on behalf of my entire family for the outstanding job. We especially wanted to thank you for adding the carrot to the plate. This special touch is what sets you all aprart, and why we will never go anywhere else. you all are more than just hand working machinges. you are hearts that care, and we are so very thankful. The plate is for our 8 1/2 year old English Bulldog. He died 1/11 when his spleen burst. It was very unexpected and extremely sad. We now have a 9 week old English Bulldog male who is full of energy. It is helping us in our sorrow over Buford. All the best to you, and we will remember you for any future plates. We received the plate, and it is PERFECT. So glad we found your website!!! Thanks for the GREAT fast service. You had a great selection and the best prices on the internet and we found you with a Google search for engraved plates. We will certainly keep you in mind for future business. Have a question about your Pet's Memorial Plate? 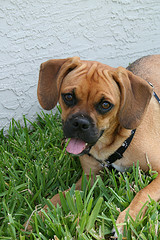 Our dog “Dukie” had to be euthanized after a long illness. We had adopted him from a shelter when he was about four years old and had him since. He provided much joy to my wife and me for his remaining years. We decided to have him cremated and when we picked up his cremains they were in a nice cherry wood box. Although the box was nice, I felt that it needed an extra touch, a memorial plate. I chose a leaded brass plate with an adhesive backing to add to the box. It looks great and didn’t require any additional hardware for mounting. Glory, my golden retiever, passed away three Christmases ago. I thought I was strong - boy was I wrong! This really got me going - thinking about my business - engraving plauqes & plates. I looked over all the orders and realized how many other people greive the passing of their pets. So many of the plates we engraved are for pet memorials. There are all sorts of solutions that you see listed to the left. We have solutions for outdoor and indoor memorials. It is really up to you to decide the best solution for you. We all greive differently and we all want to remember our pets that show off their personality and their relationship to ourselves. If your pet loved the outdoors - always bugging you to go out, the outdoor memorial maybe the best choice. If you have just the perfect photo of your pet have it framed and add an engraving plate. We also have black marble that your photo can be turned into a work of art to hang in your home. We etch the image into the stone. We have Tennesse Whitestone, Granite and Marble, Pennsylvania Bluestones and Carved Cast Stones that can be engraved with a special message of your choosing for your pet. In the Carved Cast Stones we even have a dog bone shape. The possibilities are endless. Take you time going though all the options to the left before making your decision. I recently ordered a number of brass plaques. I live in a golf community at La Quinta, California called Tradition (Near Palm Springs). The Club has been in existence for ten years and has a mixture of Midwesterners, Californians and Canadians amongst others. For years...everyone fell in love with a big fluffy Black dog by the name of Grover (mostly Portugese Water Dog). He endeared himself to all including Arnold Palmer who stays here a lot and designed the course. Two years ago Grover passed away and I promised Bruce and Kathleen Lehman (his owners) that I would create a fun memorial for Grover. 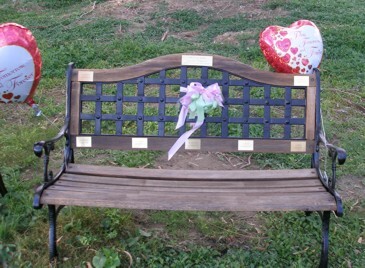 Thus the plaques which were placed on two classic park benches and put in a park that we all gather in here at the Club. Last Friday we had a gala memorial celebration and about 80 people attended and at least 25 dogs. I bought plaques also from you to memorialize our beloved dogs which have passed since we all moved here. I am attaching some pictures with this email and then forwarding some large group shots in a follow up email. Thanks for such speedy and accurate processing of my two orders. In the future Kathleen will be ordering more plaques for added dogs we missed. Best of luck to you all and thanks again!